Many of the animal groups that comprise modern reef ecosystems first appeared or radiated during the Mesozoic in the wake of the late Permian mass extinction. This event caused the extinction of up to 74% of benthic invertebrates, including major Palaeozoic reef building animals (e.g., rugose and tabulate corals). In the aftermath of the extinction, i.e., during the Induan substage, reefs were relatively impoverished and were constructed by microbialites (Figure 1). Although metazoan-constructed reefs reappear in the fossil record during the Early Triassic (e.g. Brayard et al. 2011), they were not common until the Illyrian substage, i.e., 11 million years after the extinction. Reefs, therefore, took longer than other marine ecosystems to recover (e.g. Foster and Twitchett 2014). Figure 1. Range chart of reef ecosystems across the Permian/Triassic boundary. Changh. = Changhsingian, In. = Induan, G = Griesbachian, D = Dienerian, S = Smithian, A = Aegean, B = Bithynian, Pelson. = Pelsonian, Longo. = Longobardian. Quantitative palaeoecological analyses of the recovery of benthic invertebrates following the late Permian mass extinction are currently limited to the Early Triassic and to those groups that recovered within this interval, e.g. various molluscan taxa. The recovery of reefs has been assessed only qualitatively, whereby recovery is considered to have occurred in three stages: microbial reefs appeared in the Early Triassic, Wetterstein reefs (dominated by calcisponges) in the Middle Triassic, and Dachstein reefs (dominated by corals) in the late Triassic (Flügel 2002). Previous studies of the Wetterstein reefs and related strata in the southern Alps have presented very little palaeoecological community data. How the taxonomic and functional composition of reef ecosystem communities evolved in the wake of the late Permian extinction event is therefore still poorly understood. To investigate the recovery and evolution of reef communities I focused on the Wetterstein Formation in Aggtelek, Hungary, which represents the oldest Mesozoic platform margin metazoan reef in Europe. The Aggtelek reef has received little attention since its initial description by Balogh (1948); recent biostratigraphic studies indicate an Illyrian age (Velledits et al. 2011). In this study the entire Anisian–Ladinian Wetterstein reef succession was investigated, including exposures of the older part of the reef at the Baradla Cave, Kecső Valley and Aggtelek-Jósvafő road-cut sections, and exposures of the younger part of the reef at the Nagy-Jenei Hill, Tót Valley and Pitics Hill. The exposure at these sections is often poor and discontinuous, which hinders detailed mapping and logging. Further, fossils are often not visible to the naked eye, but are visible in petrographic thin sections. Samples were therefore systematically collected along transects for later sectioning. The Aggtelek Reef is extremely diverse with 77 species identified, including sponges, foraminifera, cyanophacea, brachiopods, crinoids, dasycladaceans, echinoids, rhodophyta, bryozoans, annelids and microproblematica. 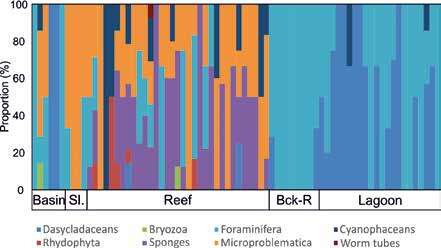 The median taxonomic richness of samples from the reef facies is 4 (ranges: 1–14 species). The species composition is highly variable among samples, possibly reflecting original taxonomic heterogeneity across the reef. Despite their taxonomic diversity, most species present are sessile suspension feeders; the only motile taxa associated with the Aggtelek reef are conodonts and echinoids (see Mihaly 1981; Velledits et al. 2011). Eighty-three samples were collected and analysed from the Steinalm, Jenei and Wetterstein Formations which represent lagoon, basin, and reef facies, respectively. The taxonomic composition of the samples shows a clear habitat differentiation (Figure 2). Samples from lagoon and back reef facies are dominated by foraminifera and dasycladaceans, samples from the reef facies are more heterogeneous but dominated by sponges, foraminifera, cyanophaceans and microproblematica, and samples from the slope and basin are dominated by foraminifera, microproblematica and occasionally dasycladaceans. There is also evidence that reef composition changed through time: no foraminifera or red algae were observed in the younger part of the reef exposed in the Aggtelek-Jósvafő road-cut and Pitics Hill section. The back reef facies shows abundant microbialite fabrics. Figure 2. Species composition of samples from the Middle Triassic (Anisian stage) of the Aggtelek Karst, grouped according to depositional environment. Sl. = slope, Bck-R = back-reef, lagoon. This study quantitatively shows the first evidence for a taxonomically diverse reef ecosystem in the Western Palaeotethys soon after the late Permian mass extinction. The reef was dominated by sponges and microproblematica and showed clear habitat differentiation from the platform interior to basin by the upper Anisian. This codominance of sponges and microproblematica contrasts with early Triassic platform margin reefs in other regions (which are dominated by the microproblematicum Tubiphytes (e.g. China, Payne et al. 2006; Romania, Popa et al. 2014)), and with Early Triassic microbialite, sponge, and Placunposis-reefs. I am grateful for the Palaeontological Association for Callomon Award PA-CA201401 that funded this project. I would like to thank Dr Kinga Hips (Eötvös Loránd University), Dr Csaba Péró (Eötvös Loránd University) and Dr Felicitász Velledits (Miskolc University) for both their hospitality and advice on exposures and sample collection; Dr Szabolcs Leél-Őssy (Eötvös Loránd University) for helping me sample, navigate, and fully experience the Baradla Cave; Prof. Richard Twitchett for hosting me at the NHM, London, at the beginning of the project; finally, Dr Louise Foster for her assistance in the field. BRAYARD, A., VENNIN, E., OLIVIER, N., BYLUND, K., JENKS, J., STEPHEN, D.A., BUCHER, H., HOFMANN, R., GOUDEMAND, N. and ESCARGUEL, G. 2011. Transient metazoan reefs in the aftermath of the end-Permian mass extinction. Nature Geoscience, 4, 693–697. FLÜGEL, E. 2002. Triassic reef patterns. In KIESSLING, W., FLUGEL, E. and GOLONKA, J. Phanerozoic reef patterns. SEPM Special Publication, 72, 391–463. FOSTER, W.J. and TWITCHETT, R.J. 2014. Functional diversity of marine ecosystems after the late Permian mass extinction event. Nature Geoscience, 7, 233–238. MIHALY, S. 1981. Az Aggteleki-karszt kozepso-triasz Echinoideai (Mitteltriadische Echinoideen des Aggteleker Karstes – Nordungarn). A Magyar Állami Földtani Intézet Évkönyve 1979, 297–331. PAYNE, J., LEHRMANN, D.J., CHRISTENSEN, S., WEI, J. and KNOLL, A. 2006. Environmental and biological controls on the initiation and growth of a Middle Triassic (Anisian) reef complex on the Great Bank of Guizhou, Guizhou Province, China. Palaios, 21, 325–343. POPA, L., PANAIOTU, C. and GRADINARU, E. 2014. An early Middle Anisian (Middle Triassic) Tubiphytes and cement crusts-dominated reef from North Dobrogea (Romania): facies, depositional environment and diagenesis. Acta Geologica Polonica, 64, 189–206. VELLEDITS, F., PER, C., BLAU, J., SENOWBARI-DARYAN, B., KOVACS, S., PIROS, O., POCSAI, T., SZUGI‑SIMON, H., DUMITRICA, P. and PALFY, J. 2011. The oldest Triassic platform margin reef from the Alpine-Carpathian region (Aggtelek, NE Hungary): platform evolution, reefal biota and biostratigraphic framework. Revista Italiana di Paleontologia e Stratigrafia, 117, 221–268.